Monday, May 29 is Memorial Day, and, by 46-year tradition, the final day of four days of the Northwest Folklife Festival. Sadly, the monorail continues its 20+year tradition of not being a free transfer to get to the festival. Ironically, it wasn’t even listed as one of the top four options for getting to the festival, despite the Seattle Center having a vested financial interest in promoting monorail ridership. Moreover, Pronto Bikeshare won’t be an option for transitting that last mile this year. On the plus side, Kitsap Transit will have some limited service on Memorial Day, breaking its tradition of shutting down for the day. There will also be special Sounder service to the Sounders’ high-noon match Saturday against the Portland Timbers. The full list of Sunday and Memorial Day service levels for transit agencies around the region is below the fold. A 6-mile single-track route running 5 trainsets at 5-minute intervals to 14 major destination stations. Serves Seattle Center with 5 stations – an underground Center House basement & Flag Pavillion Dance hall stop, Key Arena, Mercer Garage, Memorial Stadium, and a double-track station at KOMO Plaza for convenient transfers that return patrons to Seattle Center venues. South of KOMO, a 4th Ave route (northbound) with stops at Belltown, Westlake Mall, Central Library, City Hall District, International District and southernmost stop ‘atop’ Exposition Hall parking garage. Spectacular southbound views along the Waterfront with stops at Aquarium/Pike Place Market and Coleman Dock, and a 2nd Belltown stop past KOMO Plaza. Estimated cost: $500 million. Addressing traffic congestion throughout downtown Seattle: priceless. The powers that be subtly censored the Circulator Monorail with no explanation. There’s more money to be made keeping the public completely dependent upon driving. Transit systems with limited potential serve as a pretense of dealing with Seattle’s traffic nightmare. 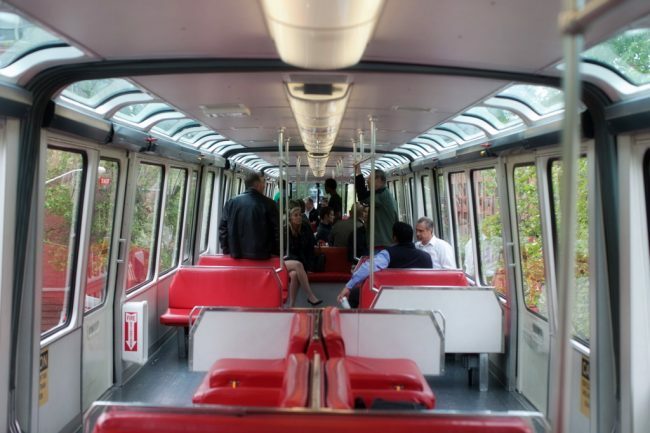 Many Seattlers were disappointed when the much larger monorail plan failed. They were not given the chance to see a formal review of the Circulator Monorail nor its companion proposal – the 1st/3rd Trolleybus Circulator and the Trolleybus Reconfiguration, all relatively low-cost transit designs with more potential than streetcar and standard buses. Public participation in Seattle is more of a pretentious formality. That said, the Circulator Monorail is still possible as is the 1st/3rd Ave Trolleybus Circulator. Both would serve Seattle entertainment venues far more adequately than the 1st Ave streetcar connector. Can’t Kshama Sawant and Jeff Bezos take care of this one before Memorial Day? The American Legion too. Just too bad this isn’t SeaFair. How about everybody just wave their transfers and get on the Monorail anyhow. Or…post a couple of ST fare to check ORCA cards. And those spring-loaded batons in their belts to be sure no employee of a transit system impostor tries to block the doors. Some Holiday spirit here. Doubt anybody being Memorialized would have wanted one more un-eagle-related leaving off a hen-house door between their admirers and their ceremony. The number 8 is the only way to go! A bus bursting with happy Folklifers VERY slowly inching its way up Denny, over I5 and then tackling the adjacent very steep block (the one favored by snow sliders )of Denny leading to Capitol Hill is the very essence of 21st Century Seattle. It’s hard for me to understand the constant bellyaching on this blog about the fact you (pass holder, probably free from work) have to pay $2 for rising the monorail. Didn’t you waste twice that on coffee this morning? Just pay like everyone else…or take the bus. By that principle, shouldn’t Metro be able to immediately do away with all transfers? Since it can’t, it seems clear that a transfer does have some value. Or by your bizarre logic and conclusion jumping, we should require paper transfer from Sound transit to KCM. Or make ferries accept transfers. “Since some people will want to do it” and all. Worldwide, the transit agencies with the best ridership have fare integration. I expect a lot of people would be happy to have $2 dinged from their Orca purse, but DO NOT WANT to carry cash. Cash is for tourists and poor people who occasionally need to use the bus, not experienced transit users. It’s especially painful at the Monorail. It’s run as the amusement ride that a place like Seattle Center wants it to be. “Just take the bus, like everyone else.” Fixed. FWIW, I don’t drink coffee.